As humanity faces ecological disaster, we must find wisdom wherever we can—even in religion. The god of Moses commanded the Israelites (mythically or otherwise) to undertake a campaign of genocide in Canaan. The idea of separating religion and government is not new to Africa. Elements of secularism are identifiable in precolonial African societies. Winning future church-state lawsuits may require us to step away from the familiar arena of “religious freedom” and into the more inclusive arena of freedom of conscience. Predictions of the imminent decline of atheism keep on coming . . . and they keep failing to come true. In an authoritarian Facebook post, one Catholic bishop reveals more than he might have meant to. Is It Ethical to Conceal Your Atheism? On further consideration, there are still specific situations where it is ethical to conceal your atheism. There are risks, but the prospect of reducing parasitic diseases through gene-drive genetic engineering seems too good to pass up. Critias believed not in religion but only in its utility. His closet atheism made him more reprehensible than many tyrants who were honest theists. Uncharacteristically, Israel silences a domestic critic. But Hamas is the real enemy. Despite early Christians’ efforts to destroy it, the ancients—especially the Greeks—had much of value that contemporary society could stand more of. Our approach toward a more secular society cannot be solely achieved through the courts. 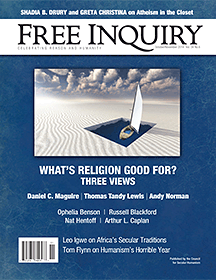 Letters in response to the August/September 2014 issue of Free Inquiry. Outrage over Hobby Lobby—and a priest turns (sort of?) secular humanist. The Dalai Lama carries some serious baggage, which scarcely anyone in an unfairly adoring West will dare to speak about. The atheist’s understanding of death is only enriched by understanding the neurochemistry of attachment, loss, and mourning. Much—so very much—that afflicts humanity today can be traced to the story of the Garden of Eden. The Fifteen Commandments according to one secular humanist. We honor Barbara Stanosz, Humanist Laureate and philosopher. A review of Plato at the Googleplex: Why Philosophy Won’t Go Away, by Rebecca Newberger Goldstein. A review of Philosophy for a Better World, by Floris van den Berg. A review of Teachers versus the Public: What Americans Think about Schools and How to Fix Them, by Paul E. Peterson. The poem from the October/November 2014 issue of Free Inquiry.